It was the evening of February 28, 1958. A highly publicized murder trial was underway in a New York City courthouse as the nation watched and awaited the verdict. 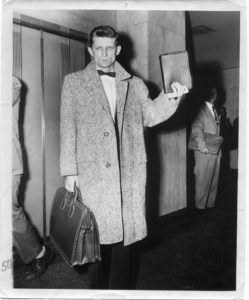 David Wilkerson, a 26-year-old Pentecostal preacher from Pennsylvania, had made the eight-hour drive from his quiet mountain village to downtown Manhattan for a simple reason - to speak to the seven accused gang members about God’s love and their salvation. At the close of trial proceedings, he rushed to the front of the courtroom and pleaded with the judge for permission to meet the teenage defendants. News media stayed live as Wilkerson unwittingly made himself the source of headline news. The judge resisted the request. He had been receiving death threats during the trial and almost had Wilkerson arrested as a presumed assailant. He ordered Wilkerson never to return to his courtroom. The refusal inspired Wilkerson’s move to New York City where he began a street ministry to drug addicts and gang members. In the years and months that followed, Wilkerson authored the best-selling book The Cross and the Switchblade and founded Teen Challenge, a faith-based drug rehabilitation program serving troubled youth and adults in the United States. In 1995, Teen Challenge expanded its reach through Global Teen Challenge, overseeing the development of local Teen Challenge programs worldwide. Wilkerson passed away in a car crash in 2011 at 79 years of age. His brother, Don Wilkerson, continues support of the Teen Challenge ministry, having served as the executive director of the initial Teen Challenge center in Brooklyn, New York, and as the Global Teen Challenge Executive Director from 1995-2007. Don is the author of The Cross is Still Mightier than the Switchblade, Within a Yard of Hell, Counseling by the Scriptures, and Called to the Other Side. Today, Global Teen Challenge operates over 1,400+ affiliate centers in 125 nations, with one of the highest addiction recovery success rates anywhere in the world.